Why PDF/A and not PDF? Why has a special PDF standard now been defined for archiving documents? 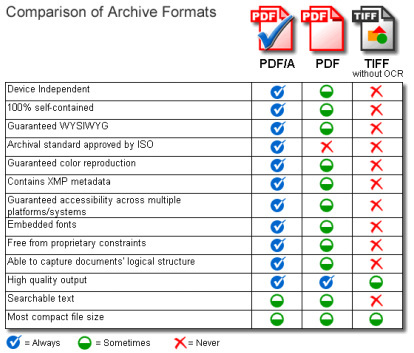 Are traditional PDF documents not "good enough" for long-term archiving? PDF has some excellent characteristics that lend themselves to the creation of archived documents. Like a container, a PDF can incorporate completely different elements such as text, images, and fonts. In addition, it reproduces layouts that are true to the original and it is cross-platform capable. PDF in its native form cannot guarantee long-term reproducibility though. Certain requirements must be met in order to enable the exact reproduction of content in say 10, 20 30 years or more. For example, it is essential that fonts must be embedded as PDF/A is; a link to the font in question is not sufficient as is the case in a PDF file. If a font is not embedded in a PDF document it means that if, in that 10, 20, 30 years plus time-frame, a user who tries to open a document does not have a required font on his or her computer, special characters or symbols will not be displayed correctly. Fonts that are common on today's computers may not be available in the future. Imagine the problems this could create - a critical piece of information may be lost from a case file (legal field) simply because the font used to display the missing characters is no longer available. The Bottom Line: By using PDF/A files, your fonts will look the same 30 years from now as they did the day they were created. How can Choice Office Equipment help you? Our newest series of multi-functional devices (MFD's/MFP's) incorporate PDF/A scanning technology! Create PDF/A compliant documents, suitable for long-term archiving, right from the control panel of your office copier. Simply choose PDF/A, Destination Folder or eMail and "Start". All graphics and fonts will be embedded into the document preserving the information in the file and ensuring that the content will still appear as it should even after a very long time of storage. Before you purchase or lease your next multi-functional copier system, ensure that it has the PDF/A file format as a standard scan feature! Contact us today for more information or to test one of our Multi-functional Copiers (MFD's/MFP's) in your office!